John Lewis is a multitalented man who has led an interesting life. He counts civil rights activist, United States Congressman, and graphic novelist among his many accomplishments. Although Lewis represents a relatively small district in Georgia, he has worked on behalf of all Americans for most of his life. He is often seen and heard speaking out on important issues. Some call him the conscience of Congress. 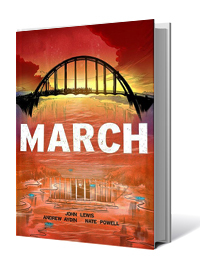 Most librarians are familiar with the March Trilogy, a series of graphic memoirs written by Congressman Lewis and his staffer Andrew Aydin. The series describes and illustrates Lewis’s history in the civil rights movement. It is one of the few that fits into many categories of interest to libraries: it was a nationwide bestseller, it appeals to both adults and young adults, it fits squarely into the African-American genre, has won multiple awards, and is a modern-day-classic of sorts. Even libraries that don’t buy many graphic novels will be interested in these. This Washington Post article tells more about how the series came to be, and provides a look at his work alongside Martin Luther King, Jr. The first volume of the trilogy became a New York Times bestseller and the first graphic novel to receive a National Book Award. After John Lewis declined to attend the presidential inauguration in January 2017, the President attacked him on Twitter. Sales of the books then spiked. Lewis and his collaborators are creating a new series, the first volume of which is scheduled to be released on October 16, 2018. 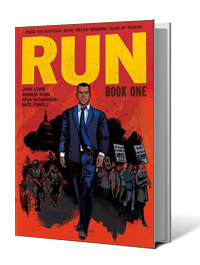 Called Run, it picks up the story after the passage of the Voting Rights Act. Along with the original volumes, it’s sure to be an important addition to any library collection. Here is a list of John Lewis titles in Bibz.